Have two players stand 2-3 steps on either side of the ball. On command both players should squarely step to address and block the ball. Coach serves ball to slightly favor one player. If the balls goes out of play or a goal is scored, two new players on. If you have 10+ players, use two grids. -Player who scores stays on and plays again. 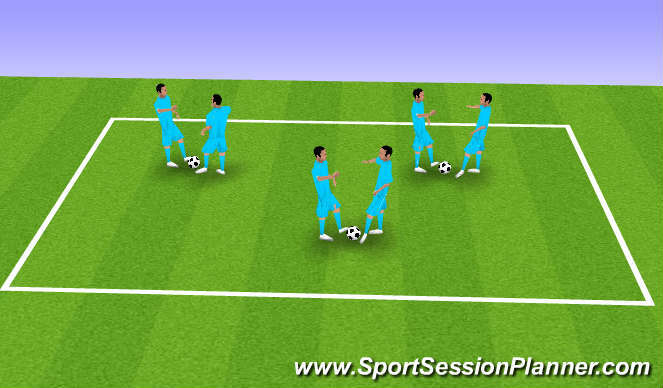 -Close down ball quickly and correctly. -Maintain a good distance to tackle and recover. -Trackle without crossing feet in order to stay balanced. Coach serves ball to slightly favor one player. Player with the ball attacks the gaol they started at. Defender must recover goal side. If the balls goes out of play or a goal is scored, two new players on. If you have 10+ players, use two grids. -Do not tackle from behind. -Tackle firmly with closet foot. Coach serves ball to slightly favor one team. If the balls goes out of play or a goal is scored, the coach restarts the play. Play 3-4 minute sets. 6 vs. 6 including goalkeepers on n a 40x50 yard field. Teams play 6 vs. 6. No conditions on play. -Tackle wieth either foot as situation demands.